Did you use CreateSpace? What should we check to ensure our books survived the migration to KDP? Click To TweetI’ll admit that I don’t sell that many print books, as the market for the romance genre largely exists in ebook form. So I decided migration issues weren’t a big risk for my sales figures compared to other demands on my time. Did Our Books Automatically Migrate? This past week, I finally had time to check on my paperbacks, and the answer to whether they automatically migrated is yes…and no. Or sort of? From what I can tell, our books did remain live through the move. Yay, no lost sales. However, they’re also not “officially” migrated until we claim them from a KDP account. Basically, they’re live in that they’re available for sale, but we can’t do anything with them. And I do mean anything—we can’t even see our sales reports—because the CreateSpace website is no more. Find all the instructions and FAQs here. The gist is that to access our CreateSpace books, we have to link those psuedo-live book files to a KDP account. Go to CreateSpace (or to the one log-in page that’s left of the site). Confirm you’ve selected the correct KDP account and click Take me to my books. When your account is ready, you’ll be sent to your KDP Bookshelf. Just for our own organization of our KDP Bookshelf, if we have books on KDP in both ebook and print, we’ll probably want to “link” those files. Contrary to some articles, this process doesn’t seem to link our books’ details pages in the store. Rather, it’s just for making it so each book has one listing on our Bookshelf. On an ebook listing on your Bookshelf, you’ll see the button “Link existing paperback.” On a paperback listing, you see the button “Link existing Kindle eBook.” Clicking either button will prompt the system to try to match listings in your Bookshelf. KDP gives us more options for keywords in our book’s metadata than CreateSpace did. Rather than 5 short fields for keywords, our print books can now take advantage of 7 long fields. Click on the three dots to the right of “Paperback Actions” and select “Edit print book details.” Add in more keywords, and check if any of the old keywords should be updated. Similarly, our print books have only one genre category post-migration, but KDP allows us to assign our book to two categories. From that same “Edit print book details” section of Paperback Actions, add a second genre category to your book’s metadata. Also under “Edit print book details,” we can check our book’s description. If you’ve used Amazon’s Author Central to update your book’s description, be aware that the migration process might have overwritten our Author Central version of our book’s description with whatever we had in CreateSpace. If we’re updating other settings for our books, we can take the opportunity to update KDP’s version of our book description to match our Author Central version. Otherwise, we might want to resave our Author Central settings to re-overwrite the migrated metadata. After we click Save and Continue to save any details we changed, the next section of the set-up process (or directly accessed by the “Edit print book content” option from the three dots next to Paperback Actions) allows us to check the content of our files in the Previewer. A few authors have mentioned the migration overwrote their book’s files with old versions of their cover or interior, so we might want to take the opportunity to check (or just update) our files. 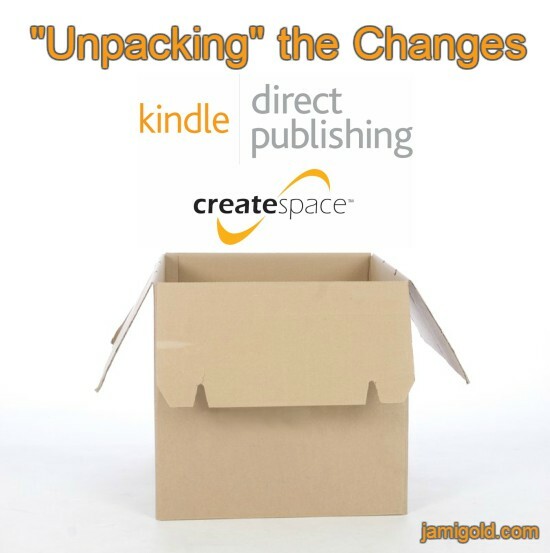 If you used CreateSpace, here are 10 things to do after the move to KDP... Click To TweetHowever, if you used CreateSpace’s Cover Creator to make your cover, you’ll have to start from scratch to make any changes to your cover file. Those Cover Creator files will continue to work fine as long as you don’t touch them, but if you want to change anything on your cover, you’ll have to upload a whole new file. Also, note the checkbox for the cover file to specify whether we want KDP to create a bar code on our back cover. This is a different setting from how CreateSpace managed the question, so if you touch your cover, be sure that checkbox is set the way you want. After we click Save and Continue to save any content we changed, the next section of the set-up process (or directly accessed by the “Edit print book pricing” option from the three dots next to Paperback Actions) allows us to check the pricing of our book. Some printing costs have increased compared to how they were in CreateSpace, especially for short books printed in Europe, so it’s a good idea to make sure our pricing and royalty amounts still work for our intentions. Also, if we “hard-coded” our prices for other countries to create $x.99 prices rather than basing them off our Amazon.com price, we might want to check how our pricing works for current exchange rates. The migration process seems to have defaulted international paperback rights to just a few countries rather than to “Worldwide Rights.” So while we’re checking on our pricing in that “Edit print book pricing” section, we can also click the radio button to select Worldwide Rights if applicable. Now is also a good time to check our Expanded Distribution setting. Whether we had that checked before or not, we can revisit our decision and make sure the checkbox reflects our intentions. If we made any changes to our print book details, content, or pricing through those Paperback Actions screens, make sure to save and publish to make those changes live. Otherwise, we’ll be prompted to complete setup of our book. If we want to double (triple?) check our book’s content, we can order an Author Copy of our books to check the finished product as well. After we’ve saved and published any changes, select “Request Author Copies” from Paperback Actions. Lastly, if we included the direct buy links to the CreateSpace store on our websites or promotional materials because of their higher royalty payments, we need to update our information to remove any links to the CreateSpace store. Did you proactively migrate your books from CreateSpace to KDP? Or did you wait for the migration chaos to calm down? If you’ve moved your books over to KDP, have your checked all these details? Or does this list help you know what to do and check? Do you have any questions about KDP or the migration process? Excellent comprehensive coverage of this ‘scary’ transition! Thankfully, i seem to have managed it okay. Will share on Twitter! Jami- As always you’re a genius! Thanks so much for doing the “hard” work for us and then sharing step-by-step instructions to make the change easy. I’m working on actually self-publishing a series and I’ve been more than a little nervous about using the KDP platform. I knew CreateSpace. The devil you know is always less intimidating the devil you DON’T know. I wished I had seen this before the migration happened, it was a mess for me. It’s all good now. My ebooks were through KDP from the beginning, but my last email notification of royalties was in 2017. I received a tax document from KDP which says I made more than I remember getting from KDP last year (not that it was a huge sum or anything, just a strange amount). I miss the ability to have help with uploading interiors and having help with covers.